Congrats to 2012 Olympian Sarah Scherer who set an NCAA record with a 597 in smallbore this past weekend in a showdown with UTEP Rifle Team. She also tied the NCAA record with a 1,195 aggregate in leading the defending NCAA Champion TCU Women’s Rifle Team to their 22nd consecutive victory. Sarah shot her record scores at a match at UTEP on Saturday. The TCU Horned Frogs topped the UTEP Miners 4,694-4,511. 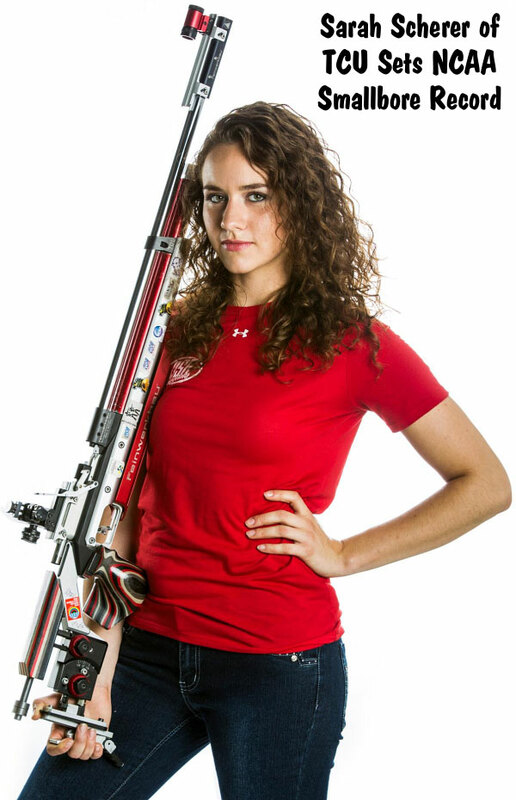 Sarah Scherer set an NCAA record in smallbore, firing a 597. Scherer added a 598 in air rifle to tie the NCAA Aggregate record with a combined 1,195. In smallbore, Sarah shot a perfect 200 in prone, a 199 in standing and a 198 in kneeling. In air rifle, she fired five perfect strings of 100, including the final four strings. Her lone 9s came in the second string of shots when she shot a 98. 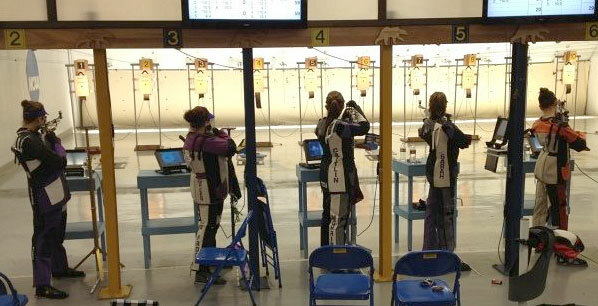 Scherer’s record-breaking smallbore shooting lead TCU to victory in the rimfire competition, with the Horned Frogs winning 2,335-2,223 over UTEP. TCU had the top four smallbore shooters, and TCU also boasted five of the top six shooters in air rifle to help TCU to a 2,359-2,288 win. TCU will fire one more match before the NCAA Championships in March. Large photo courtesy USA Shooting. Share the post "TCU’s Sarah Scherer Sets New NCAA Smallbore Record"
Most of our readers know that MTM Case-Gard offers a vast selection of ammo boxes for pistol, rifle, and shotgun ammunition. However, with such a wide inventory of box styles and sizes, it can be difficult, at first, to select the right box for your particular cartridge and carrying needs. MTM has now simplified that task by publishing comprehensive Ammo Box Charts on its website. Just log on to the Box Charts Page, and select Rifle, Handgun, or Shotshell boxes. That will open a large chart listing cartridge types, small to large, in the left column. Pick your cartridge and you will see all the storage options. MTM even codes the entries so you can see if a box allows Tip Up AND Tip Down storage, Tip Down only, or Tip Up only. For most popular rifle cartridges, there are 20-round, 50-round, and 100-round cases. 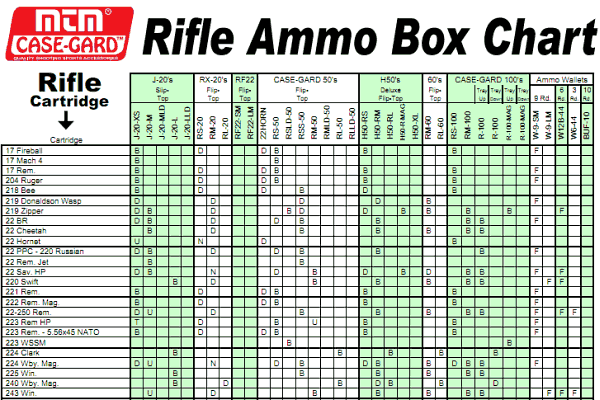 Below is the first part of the Rifle Ammo Box Chart. The entire chart is four pages long. MTM has also introduced a handy product that should work great for rimfire shooters. 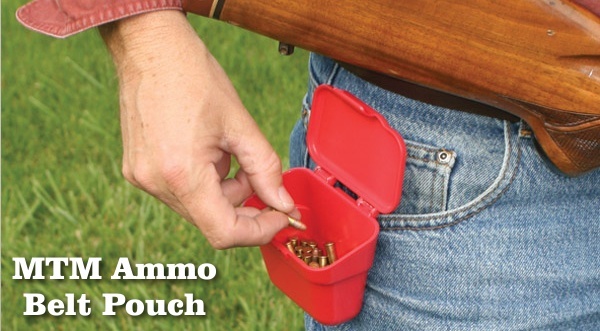 The new MTM Ammo Belt Pouch conveniently holds 100 rounds (two boxes) of .22LR rimfire ammo. With a sturdy snap latch and heavy-duty belt clip, all you have to do is pour out the ammo, then clip the pouch on your belt or jeans pocket. The Belt Pouch is also handy for saving fired centerfire brass. 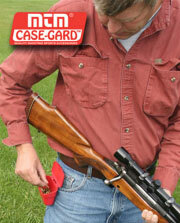 Suggested retail for MTM’s Ammo Belt Pouch is a modest $4.95. However, Grafs.com currently sells the item for $3.59 (Prod. #MTMABP). Designed to hold a 100 rounds of 22 long rifles. Holds: .22 Long rifle, 22 Magnum, 22 Short, 17 Win Super Mag, 17 HMR, 17 Mach 2, Pellets, and BBs. Share the post "Handy Charts Identify Correct Ammo Boxes for your Cartridge"